Bergen is spectacularly beautiful. It is Norway’s second largest city after Oslo, built on a fjord and surrounded by mountains, attracting the title ‘city of seven mountains’. We in Ireland believe we live in Europe’s rainiest country, but with rain at least 200 days per year, Bergen is rightly regarded as one of the rainiest cities on the planet. That said, however, it never rained once during the festival. I was the tourist with the umbrella that was never used. It was my pleasure to be in Bergen from June 16 to 19 as a member of the jury for the ‘Grieg International Choir Festival’ (GIK) and for the national choral competition ‘Syng For Oss’ (SFO). I enjoyed the company of four excellent colleagues on the jury: chairperson Margareth Ek (Norway), Andrea Angelini (Italy), Vaclovas Augustinas (Lithuania), and Terje Kvan (Norway). During gaps in our jury work, the Festival was proud to acquaint us with Bergen in all its splendour and history, bringing us to Grieg’s summer home and museum in Troldhaugen, including the wooden hut overlooking Nordås Lake where he loved to compose. It was a place I had wanted to see for many years. From the top of Mount Floyen – which we ascended by funicular – we took in the panoramic view of Bergen. And we visited the picturesque fish market and Bryggen, the old wharf from Hanseatic times. We know that Bergen was established as a trading settlement as far back as the early 11th century and that by the 13th century it was the Norwegian capital of Norway, not replaced by Oslo until the 1830s. Bryggen is a reminder of the town’s importance as part of the Hanseatic League’s trading empire from the 14th to the mid-16th century. Its characteristic wooden houses are still there, rebuilt many times on account of fires. But the essential structures remain. It was very interesting to visit this ancient part of the city. With 30.000 members, the Norwegian Choir Association (NCA) is northern Europe’s largest organization for choirs and choral conductors. It has a long tradition rooted in the strong, rich choral life of western Norway’s Hordaland region. In 1987 it was the NCA that established Norway’s first choir competition: ‘Syng For Oss’ (‘Sing for us’). 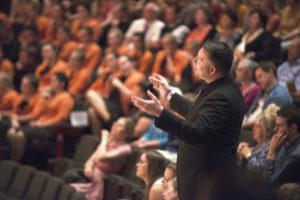 Set up as a biannual national competition open to a wide range of choirs from all kinds of backgrounds, it quickly grew to become an essential part of the country’s choral life. Having established a national competition, the Norwegian Choir Association next set its sights on the choral world outside Norway. 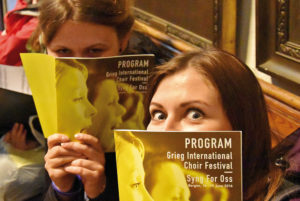 In 2004 it established the ‘Grieg International Choir Festival’ in Bergen with the objective of presenting choir music at a high international level through competitions and concerts. The inaugural festival took place in 2005 and was a success, paving the way for further festivals in 2007, 2009, 2010, 2011 and 2013, and now in 2016. Over the course of twelve years, more than 110 choirs from 24 countries have taken part in the festival. There was an expansion in 2009 with the addition of a new youth competition for solo voice. 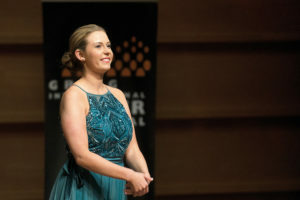 The ‘NINA Solo Competition’, for classically trained singers aged between 16 -24 years, was run for the first time in 2010 and subsequently in 2013 and 2016. In 2015 the ‘Grieg International Choir Festival’ and the Norwegian Choir Association decided that the 2016 festival would bring together all three competitions. Accordingly, ‘Syng For Oss’ and the ‘Grieg International Choir Festival’ – at which my colleagues and I adjudicated – were held simultaneously in Bergen, while the ‘NINA Solo Competition’ took place over the same weekend at the concert hall in Grieg’s Troldhaugen summer home. The final of the solo competition and Grand Prix of the choral competitions were presented together on the same evening. This was a resounding success to my eyes and ears, and it is easy to imagine this collaboration continuing into the future. According to Festival Manager Annlaug Haus, the driving force behind the new plan, “We think this was a good idea: international and local integrated in one festival. We will develop this festival in the future with a stronger connection between the festival and competitions”. Annlaug is also keen to deepen the connection with Grieg in future years. In addition to the parallel competitions, participating choirs took part in a selection of friendship concerts and other festival events in Bergen and the surrounding area. Concerts took place in a variety of churches, open-air venues and concert halls. With the national and international competitions all taking place together for the first time, we on the jury agreed that Norwegian choirs in ‘Syng for Oss’ could be eligible to win prizes with slightly lower marks than those of the international competition. The Association agreed that this would be an effective way of encouraging national choirs. With one exception, all competitions took place in the magnificent Grieg Hall (Greighallen), the 1500-seater home of the Bergen Philharmonic, masterfully designed in the shape of a grand piano. The one exception was the opening competition for Sacred Music which took place in Bergen Cathedral (Domkirche). What a privilege to adjudicate in a building that dates back to the 12th century and with such excellent acoustics. The competition attracted a very high international standard, with the winning equal-voice choir – La Cappella from Sweden – garnering 23.5 marks out of a possible 25. We were particularly impressed with their supported tone, good tuning and excellent programming which included pieces by Dino Stella, Mårten Jansson and György Orbán. We were also impressed with the second- and third-place choirs: Poland’s Paderewski Chamber Choir and the Ondrasek Czech Youth Choir. The following day the competitions moved to the Grieg Hall which also provides ideal conditions for choral performance. Norway’s charming mixed youth choir Viva Sandnes Kulturskolekor won the international Folk Music competition, followed by Bergen scoring a hat-trick when three of the city’s choirs won national competitions: Volve Vokal, an excellent female ensemble, won the Open Class, Multa Paucis was the winner of the Female Voice competition, and Bergen Mannskor won the Male Choir competition. 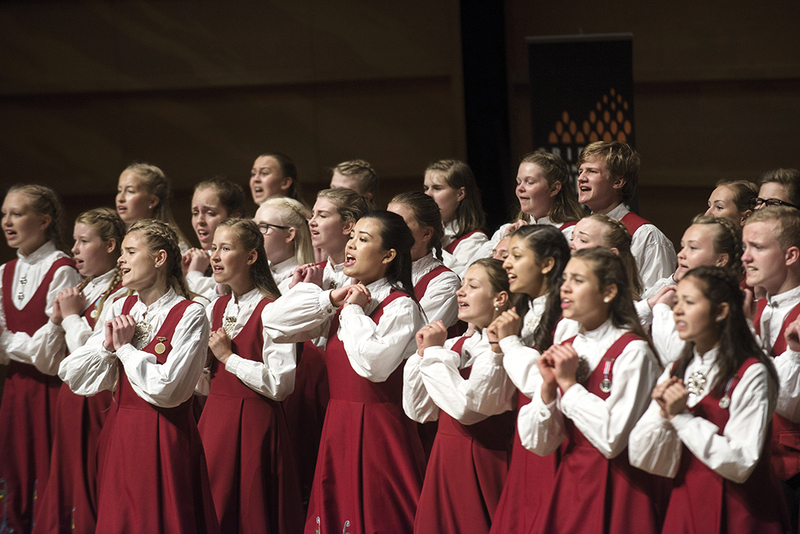 The national Mixed Choir competition was won by Osterøykoret, a mixed choir from the island of Osterøy, north-east of Bergen, with an entertaining programme including a humorous arrangement of All About That Bass by Kevin Kadish. The Contemporary Music competition produced the highest standard of the Festival with an outstanding performance by the Paderewski Chamber Choir from Poland. They sang Jubilate Deo by Fredrik Sixten, Come Sleep by Daniel Brinsmead, and the exciting and rhythmic Kalinda by Sydney Guillaume. I was riveted throughout. The national Children’s Choir competition was delightful. The three choirs performed to a high level and took all three prizes with first prize going to Skedsmo Voices, a large children’s choir made up of young members from Romerike and Oslo. Among our duties on the jury was selecting the eight best choirs for the Grand Prix. The result was a wonderful evening full of performances that ranged from entertaining to joyful to moving. This was followed by the final of the ‘NINA Solo Competition’ which took place once we the adjudicators had left the hall to carry out our deliberations. Although each choir had presented itself at its very best, there can only ever be one winner and on this occasion it was the Paderewski Chamber Choir which again proved an outstanding ensemble in all ways. The evening included the awarding of many prizes – and of substantial monetary value – and concluded with a repeat performance of Kalinda by the Grand Prix winners, followed by a closing party. The festival was a great event. It demonstrated how choral singing is very well supported in Norway and therefore enjoys an excellent state of health. I was very impressed with the wide variety of Norwegian choirs and also with the quality of international choir that the Festival is able to attract. Norwegian choirs are able to compete at national level with a view to progressing in time to international level. By providing a genuinely international and expert jury, the Festival ensures that choirs are adjudicated at a high level and that they can be confident of where they stand in relation to choirs from all over the world. Singers to whom I spoke are very appreciative of the Norwegian Choir Association and its commitment to choral singing and music in Norway. From my personal perspective, too, this was an impressive event. I greatly enjoyed working with my excellent chairperson and colleagues on the jury, and in a beautiful city with outstanding venues (and no rain). Above all, I appreciate the opportunity to have heard so many very fine performances of wonderful music by choirs from both within and outside Norway.